The objective of this Course is to teach the beginner the fundamentals for better comprehension of the Greek language. It is an intensified course of study, yet the techniques and principles of the curriculum are presented in such a simple manner that makes it very easy to follow. Everything is presented systematically in a cumulative progressive way. The strict criterion of the whole process is that even the most difficult aspects of the language are taught simply and methodically. Part One: Teaches reading, writing, vocabulary. Part Two: Offers the simplified rules of grammar and the mechanism of the language. Part Three: Contains additional vocabulary and conversation which progressively becomes more difficult and complicated . The course was offered to hundreds of students, prior to being established as the basis of the Psyhogeos Program - the simplified Greek Language Series, for the teaching of Greek as a second language in a comprehensive manner. The outcome of the 15 lesson course was always overwhelming. Comes with either CD's or 2 audio cassettes. plus $4.50 for postage and handling. The book is based and it is an extended version ofthe Mini-Course consisting of three parts. Part one: teaches: reading, writing and vocabulary. Part two: gives the simplified rules of grammar with many examples and explanations in English. Part three: contains 27 lists of the most commonly used vocabulary and much more. The book is highly recommended for anyone who wishes to learn or improve his/her Greek. It is most effective accompanied by a 90 min. tape cassette. Description: This is the 4th revised and enhanced edition of the originally titled "Converation in Greek". Booklet and tape are designed to help with everyday conversation and useful phrases. They contain over two hundred sentences, questions and answers along with a very extensive vocabulary.One could listen to the CD/tape while working, driving, exercising, watching TV and so forth. The sentenses are given slowly to give you the opportunity to repeat it or translate it before the explanation is given.It is a cumulative, progressive way to build up your conversational skills. The book helps you master what you learn and comprehend the grammatical elements that are used throughout the interactive dialogues. 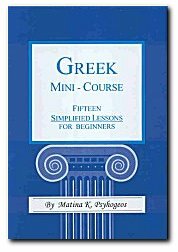 The set is excellent as an entity or as a companion to the "Greek Mini-Course, for Beginners" or to the book "Learn to Read and Write Greek"